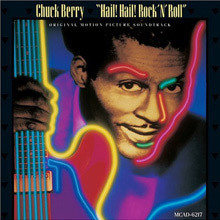 "Hail Hail Rock 'n' Roll"... all hail Chuck Berry. Half a year before America realised that a white man could sound like a black man, Charles Edward Anderson Berry distilled the blues, country music, western swing and a whole lot more into the irresistible, Maybellene. It was the beginning of a career that has lasted over half a century, influenced everyone, including The Rolling Stones, The Beatles and The Beach Boys and just about every band in pop and rock. There is hardly a guitar player alive who has not at one time played Chuck Berry's licks and tunes. "Even his leads are rhythm. It's all two-string stuff, it's beautiful. To me, there's no such thing as rhythm guitarists and lead guitarists. The musician does that to himself by doing too much on one end and letting the rhythm section carry the rhythm. A guitar player is somebody that can play rhythm and lead. Chuck Berry's solos take off as an extension of his rhythm work without losing the drive or point of the song." Keith Richards It's hard to imagine what modern rock music would have been without Chuck Berry. His genius lay in his ability to "present" a song. The man that most people have seen on stage in the last 40 years has little or nothing to do with the duck-walking guitar-slinger that was a revelation in his hey-day. 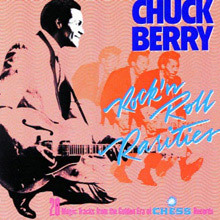 Like many of his contempories that recorded for Chess, Chuck Berry's records were geared towards the selling of singles. Many of these are included here on albums like The Anthology and The Best of Chuck Berry. 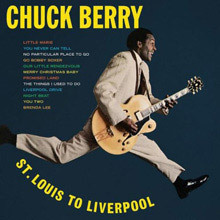 However there are also classic album recordings which include St Louis to Liverpool - it sounds corny but the playing and the songwriting prove that Chuck Berry did his best work in the 1950s and prior to 1963. Chuck Berry is one of the most important figures in the history of popular music and the development of rock. You all know the hits, start exploring some of his deeper catalogue to appreciate the man who is undoubtedly a genius. In his autobiography, Chuck says he was born in St. Louis, while others say he was not, insisting he had been born in San Jose California and moved East with his parents when he was a very small child. Berry learned the guitar in the late 1930s and was soon playing at parties and school dances. He worked with the Ray Band's Orchestra in St Louis; his musical apprenticeship was cut short in 1944 when he was sentenced to three years in a reform centre after car-jacking a man at gunpoint. After his release he formed the Chuck Berry Combo and started working around the St. Louis area. He later moved to Chicago where he met Muddy Waters who had been a musical influence on Berry, along with, Nat King Cole. While some may find this surprising, Cole and Louis Jordan were the preeminent black performers and both played their part in the development of any younger black performers during the 1950s. In Nat's case it was not least because of his ability to crossover and appeal to white audiences. Chuck was beginning to attract white fans that loved his outrageous stage performances. Muddy Waters introduced Berry to Leonard Chess who immediately signed him to a recording contract. Within a few weeks, on May 21st 1955, he cut his first record; it was heavily influenced by 'Ida Red', a country blues tune that Berry renamed 'Maybellene'. Maybelline has Willie Dixon on bass, Jerome Green from Bo Diddley's band on maracas and Johnny Johnson, on piano and it went to No.1 on the R&B charts for 11 weeks and No.5 on the Hot 100 in 1955; it was not the birth of Rock 'n' Roll but it was a defining moment. It went on to sell a million copies. 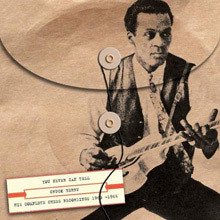 The B-side was a classic blues song entitled 'Wee Wee Hours', which showed off Chuck's traditional roots. It was another year before Chuck made the Billboard charts but he was a firm hit with black audiences who propelled his next two singles, 'Thirty Days (To Come Back Home)' and 'No Money Down' into the R&B top 10. In May 1956 'Roll Over Beethoven' made a modest breakthrough into the national charts while also making No.2 on the R&B charts. Perhaps somewhat surprisingly given it's place in the rock canon Chucks homage to classical composers and their music and the need for all the old cats to move over was not as big a hit on the Billboard Hot 100 as some may imagine. It made No.29 on the chart in the summer of 1956 and did not chart at all in Britain. In November 1963 it became the opening track of side 2 of the Beatles' second British album, With The Beatles and introduced some people who may have missed it the first time around. 'Too Much Monkey Business' and 'Brown Eyed Handsome Man' followed and both sides of the single went top 5 on the R&B charts but failed to do anything on the Hot 100. 'School Day' became Chuck's next Billboard hit when it climbed to No.3 on the charts in the spring of 1957, while simultaneously topping the R&B charts. Elvis Presley's 'All Shook Up' was at the top and The Diamonds' 'Little Darlin' at No.2 so perhaps it is hardly surprising that Chuck didn't climb higher. Chuck's success on the national chart attracted promoters to the potential for Chuck to be included on 'The Biggest Show of Stars for 1957', a mixed race tour, in which he appeared with the Everly Brothers, The Crickets, The Drifters, Frankie Lymon and The Teenagers, Fats Domino, Paul Anka, and Sam "The Man" Taylor. It opened in Brooklyn's Paramount Theater on I September and played in almost every state, coast to coast. Berry also appeared on national television as a guest on Guy Mitchell's show in December 1957 where he performed 'Rock & Roll Music', his follow-up to 'School Day. Off the back of 'The Biggest Show of Stars for 1957', tour 'Rock & Roll Music', a classic rock and roll record that tells it just like it is, made No.8 on the Hot 100 and went two places better on the R&B charts. It features the wonderfully named Lafayette Leake on piano, Big Willie Dixon on bass and Fred Below on drums; all stalwarts of the Chess studio sound. Countless bands including The Beach Boys, who took it to No.5 on the Hot 100 in 1976, have covered it. It was also a staple song in the Beatles live repertoire in their Hamburg days and during many of their live radio broadcasts in 1963. 'The Biggest Show of Stars for 1957' ended its near three-month perambulation across America in Richmond Virginia on 24 November 1957 as 'Rock & Roll Music' was climbing the charts. Chuck Berry headed home to Chicago and after Christmas he went back into Chess studios on 29 December to record with the same group of musicians that made 'Rock & Roll Music'. 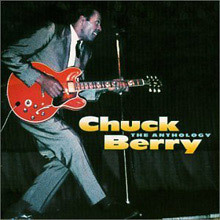 They cut 7 different titles that day including 'Sweet Little Sixteen' which was Chuck's next single and another classic of the genre - 'Johnny B. Goode'. In the days before political correctness, never something that has sat well with rock 'n' roll and in a world very different from today many girls in America were married at sixteen (and younger). It was a common theme among rock 'n' rollers and bluesmen alike. 'Sweet Little Sixteen' was Chick's second highest charting single on the Hot 100 when it stalled at No.2 in early 1958, kept from the top spot by the Champs' 'Tequila'. Nothing could keep it from the No.1 on the R&B charts and with 'Reelin and Rockin' on the B-side it's the perfect rock and roll record. 'Sweet Little Sixteen' was Chuck's second British hit, reaching No.16 in the spring of 1958. Musically Brian Wilson 'lifted' the melody and arrangement of this song for The Beach Boys' 'Surfin' USA'; Berry has in latter years, after a court case, been given a co-writing credit. 'Johnny B. Goode' opened with an intro that has become something of a signature piece; not just for Berry but also whole host of bands, including The Beatles. It is a great rocking intro that has been copied thousands of times, but the truth is Chuck was playing under the influence. Twelve years earlier, in 1946 Louis Jordan was a man that every aspiring black musician looked up to. Along with his Tympany Five he recorded 'Ain't That Just Like A Woman'. The guitarist with the Tympany Five was Carl Hogan and his guitar intro to the song was almost note for note the same as Chuck Berry's later recording. As the old adage goes; there ain't no such things as new ideas, there's just old ones thought of again. In fact Jordan's recording is yet another that can qualify to be entered into the contest for, what was the first rock 'n' roll record? Following Sweet 'Little Sixteen' was an almost impossible task and if any record could it is 'Johnny B. Goode'. From it's brilliant, if not totally original opening riff, to the lyrics that conjure up the country which Berry realised appealed to many of his fans, 'Johnny B. Goode' is a quintessential rock 'n' roll record. It made No.8 on the Hot 100 and spent close to four months on the chart and just failed to become Berry's third chart topper on the R&B charts. Berry's lack of serious chart success was hampered by a period in jail after being convicted of transporting a minor (she was 14 years old) across a state line. Berry served 3 years in jail and while there's little doubt that racial and press prejudice hampered his cause the effect on his career could have been catastrophic; arguably it was the British invasion that helped relaunch him. It was 'No Particular Place To Go' that made the Billboard Top 10 in high summer 1964. Above Chuck were a number of British Invasion bands and at No.1 was The Beach Boys and I Get Around, with Mike Love's lyrics that had been inspired by Old Flat Top himself. 'No Particular Place To Go' should have been the end of any meaningful chart placing on both sides of the Atlantic (it reached no.3 in Britain). However, six years later Chuck topped the charts in Britain and America, and in many other countries, with 'My Ding-A-Ling', a record that's only connection with rock 'n' roll is its subject matter. Throughout the 1960s, and even the 1970s, Berry continued to influence both American and British bands, they were derivative of Berry in the same way as he was derivative of the late 40's proto rock 'n' roll of Louis Jordan, Joe Turner and Wynonie Harris. Despite a third jail term in 1979 for tax evasion - in itself not something likely to detrimentally effect his career, Berry has continued to perform, mostly with pick-up bands; which is hardly a problem given his influence on every rock and pop wannabe of the last six decades (both Bruce Springsteen and Steve Miller played in Berry pick-up bands). Falling squarely between the 71-track triple-disc Chess Box and numerous single-album distillations of Chuck Berry's hits, most notably The Great Twenty-Eight, is this 2000-released, chronologically compiled double-disc set. Its 50 tunes include all of Berry's seminal Chess hits plus key album tracks like "Beautiful Delilah," "Jo Jo Gunne," and "Jaguar & Thunderbird" that were influential but never cracked the charts. The 20-page booklet features a fascinating, extensive essay that provides crucial insights into Berry's work as well as rare pictures and track-by-track personnel listing. Since virtually all of Berry's essential work was done for the Chess label, now part of the Universal empire, there's no reason to decry the lack of anything from Berry's Mercury years, even though those tracks are now owned by the same company and could have been included, especially tacked onto disc two that times out at a relatively conservative 64 minutes. This is the soundtrack to a documentary film chronicling a concert held to celebrate Chuck Berry's 60th birthday. The band was led by Keith Richards and featured Berry's regular pianist, Johnnie Johnson, Richards' regular pianist, Chuck Leavell, Rolling Stones sax player Bobby Keys, bassist Joey Spampinato from NRBQ, and drummer Steve Jordan from Richards' solo band. 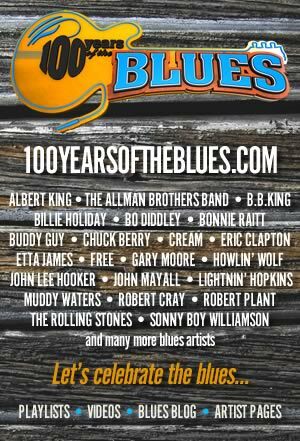 The guests included Robert Cray, Linda Ronstadt, Eric Clapton, Julian Lennon, and Etta James. Berry was ragged-voiced but enthusiastic, the band had spirit, and the guests, even if they were sometimes unlikely, were sincere. The best way to hear Berry's music is to obtain the original recordings, of course, but as a souvenir of the Taylor Hackford film, this is an enjoyable romp through the catalogue. One-half of this album is a studio recording featuring Ian McLagan and Kenny Jones of the Faces. The other half is a live recording from the Lancaster Arts Festival in Coventry, England, featuring performances of "My Ding-a-Ling" and "Reelin' and Rockin'" that, in edited form, became the first hit singles for Chuck Berry in many years. ("My Ding-a-Ling" went gold and hit #1.) This gold-selling, Top Ten album represents Berry's commercial, if not artistic, peak. On this follow-up to The Great Twenty-Eight, the songs are familiar, but the versions are not. Delving into the Chess Records archives, producer Steve Hoffman has come up with 20 tracks, many in unreleased or unusual versions. Some are demos, some are stereo recordings of songs usually heard in mono. Hoffman has remixed many of them, bringing up the '50s and '60s sound quality to near-'80s standard. Start with The Great Twenty-Eight, but come to this collection for interesting new ways to hear the old Berry favourites. This album puts the lie to the popular myth that Chuck Berry's music started to fade away around the same time that the Beatles, the Rolling Stones, et al. emerged covering his stuff. His songwriting is as strong here as ever -- side one is packed with now-familiar fare like "Little Marie" (a sequel to "Memphis, Tennessee"), "No Particular Place to Go," "Promised Land," and "You Never Can Tell," but even filler tracks like "Our Little Rendezvous" and "You Two" are among Berry's better album numbers, the latter showing off the slightly softer pop/R&B side to his music that many listeners forget about. Side two includes a bunch of tracks, including the hard-rocking "Go Bobby Soxer" and the even better "Brenda Lee," the slow blues "Things I Used to Do" (with a killer guitar break), and the instrumentals "Liverpool Drive" and "Night Beat," one fast and the other slow, that never get reissued or compiled anywhere. While the man has been feted with numerous best-ofs, box sets and double disc anthologies, this 11-track best-of, part of MCA's 20th Century Masters Millennium Collection, rings the bell in a big way, gathering some of his most essential items on one mid priced disc. Kicking off with "Maybellene" and moving right into "Roll Over Beethoven," "Brown Eyed Handsome Man," "School Day," "Rock and Roll Music," "Sweet Little Sixteen," "Johnny B. Goode" and "Carol," the list begins to sound like the history of early rock & roll itself. With the addition of '60s and early '70s hits like "No Particular Place to Go," "You Never Can Tell" and the single edit of "My Ding-A-Ling," you have a Chuck Berry best of that's all killer and no filler, guaranteed to get the juices flowing everytime it's played, no reprogramming necessary. On the 1961 single "Go Go Go," a side that went nowhere on the charts, Chuck Berry sang that he was "Mixing Ahmad Jamal in my 'Johnny B. Goode'/Sneaking Erroll Garner in my 'Sweet Sixteen'/Now they tell me Stan Kenton is cutting 'Maybellene'" -- as always, Chuck is stretching the truth to fit his story. Kenton never cut "Maybellene" but Berry did sneak some jazz into his rock &amp; roll in the '60s, along with plenty of blues, country, and some folk, all evident on You Never Can Tell: The Complete Chess Recordings 1960-1966, Hip-O Select's second volume of Chuck's Chess recordings. Of course, Berry never was stylistically pure -- he invented rock &amp; roll by marrying hillbilly and the blues -- but on his '60s sides he had the opportunity to both stretch out and dig deep, sometimes cutting a set of blues, sometimes expanding with horns or backing vocals or cutting a Twist. The latter is pretty good evidence that some of these wanderings may have been reflections of the times, but as a whole body of work the four-disc You Never Can Tell -- which gathers all the master studio takes, adds some alternates to the mix, and unveils a previously unheard live date that presents the rarest of things: a full adult-oriented concert given by Chuck at a Detroit casino where he was backed by an uncredited group of Berry Gordy's all-stars -- feels like the work of a man who is fully aware of his strengths and abilities, able to subtly tweak them toward the times without losing his identity. Indeed, one of the striking things about the set is how vigorous Chuck Berry seems in the first half of the '60s, a time that did not treat all '50s rock & rollers particularly well. Of course, Chuck was not immune to the downward dip in rock & roll in the early '60s: he was arrested for a Mann Act violation in 1959 and spent the first years of the '60s embroiled in a legal mess leading to a five-year jail sentence of which he served roughly a year and a half. Before he entered prison, he recorded furiously: about the first disc and a half of You Never Can Tell dates from 1960 and 1961, as Chuck was laying down as many sides as he could, just in case he went away for a long time. Some of these sessions do seem a little hurried -- there aren't many originals, particularly in 1960 -- but this did give him an opportunity to record some very good blues-heavy sessions, where he was able to indulge in his fondness for Charles Brown, Nat King Cole, and Amos Milburn. And while there weren't many originals, those that were there were quite good, especially the "Johnny B. Goode" sequel "Bye Bye Johnny" and his latest car song, "Jaguar and Thunderbird." 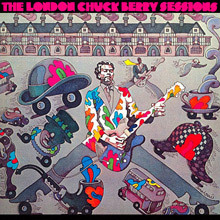 The 1961 sessions produced an even stronger crop of originals with "I'm Talking About You," "Come On," "Go Go Go," the "Junco Partner" adaptation "The Man and the Donkey," and "Trick or Treat," the latter two appearing on the excellent fake live album Chuck Berry on Stage (the cuts here being presented without the audience overdubs). Chess planned to launch Chuck's post-prison comeback with a genuine live album recorded at Walled Lake Casino in Detroit in October of 1963, but the record was scrapped, laying in the vaults unreleased until this set. The very reasons why the album was abandoned are why it's such thrilling listening now: the performances are rough and ragged, with Chuck lurching from mood to mood on the closing medley of "Goodnight Sweetheart Goodnight," "Johnny B. Goode," "Let It Rock," and "School Day," and he spends an inordinate amount of time telling corny old jokes from the stage. It's hardly perfect, but it's a rare glimpse into Berry's on-stage charms and a vital live document of early rock &amp; roll that's more interesting now than it might have been at the time. In any case, Chuck didn't need the boost from the live set: he came back stronger than ever in 1964 with the hits "Promised Land," "No Particular Place to Go," "You Never Can Tell," and "Nadine," all featured on his classic LP St. Louis to Liverpool, its title an explicit reference to how his music inspired the British Invasion. Discounting Elvis, who existed in his own category by that point, and the Everly Brothers, who continued to have hits, Chuck Berry was the only rock & roller who rubbed shoulders with his progeny, due both to his clear influence on the Beatles and the Rolling Stones and also his vigorous writing. Berry's mid-'60s work rivals his late-'50s work, perhaps not in terms of innovation but in sheer lyrical and musical might; this is plainly apparent in the aforementioned quartet of hits, each one as crisp and clever as "Brown Eyed Handsome Man" and "Johnny B. Goode," but he had plenty of unheralded gems during this stretch, including the dynamite "Dear Dad" (a song so compact and blazing that plenty of punks cut it about a decade later), "It Wasn't Me" (a song he revisited in the '70s), "My Mustang Ford," "It's My Own Business," and "Ramona Say Yes." 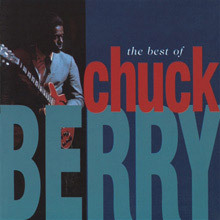 Add to that Chuck's instrumental jam LP with Bo Diddley -- an album consisting of two tracks that ran well over ten minutes, a length nearly unheard of on a rock & roll record in 1964 -- and some additional blues, and Berry's '60s sessions amount to a truly remarkable run that deepens and adds new dimensions to what was already one of the greatest legacies of 20th century American music.